Numbered, limited edition half-speed mastered 180-gram nine record box set! Leonard Bernstein conducts the Wiener Philharmoniker for these recordings of Beethoven's 9 Symphonies in this limited edition nine record box set. 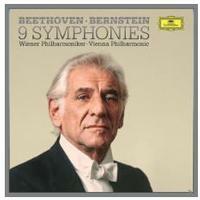 Leonard Bernstein's legendary Beethoven Symphony cycle with the Vienna Philharmonic, from 1977-1979. Newly remastered at half-speed affording a greater fidelity of higher frequencies and an epic improvement in sound quality. Newly-cut lacquers from Emil Berliner Studios from the original analog tapes, 180-gram vinyl in a numbered edition, lift-off lid box with adapted original cover of the original 1980 release. 2018 is the 100th Anniversary of Leonard Bernstein's birth.